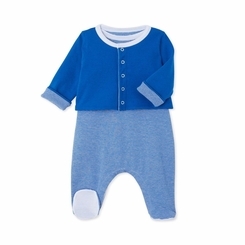 Crafted in cotton jersey, this baby boy set includes two pieces: a baby reversible plain/5000 raies-striped cardigan and a refined milleraies-striped sleeveless sleepsuit with a charming nautical badge. A practical set with its numerous poppa openings. A sleepsuit and cardigan fashioned in 5000 raies, the new stripe inspired by Petit Bateau's iconic milleraies design!